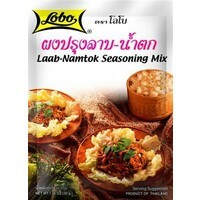 The tasty legend of Laab was taken to Bangkok by the people of Issan (Northeastern Thai provinces near the Mekong River). The blend of ethnic herbs and lime juice makes this dish tangy and very refreshing. It is commonplace that Laab-Nam Tok is served with steamed sticky rice (Glutinous rice) packed in a traditional bamboo basket. Roast Glutinous Rice 50%, Dried Chilli Powder 24%, Spices (Garlic, Shallot, Corriander> 8% Flavour Enhancer (Monosodium Glutamate), Salt, Acidity Regulator (Citric Acid) Flavouring. No Artifical color or preservative.